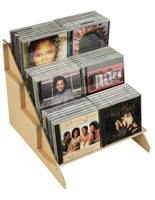 This Wire CD Display will hold 160 Individual Albums. The Welded Metal Holder Rotates for Easy Viewing of Materials. 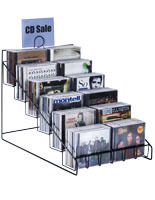 The Wire CD Display has a Sign Holder on Top for Pricing or Other Important Information. 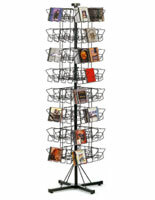 Tiny size of wire holder will present 160 albums in tight spaces. Rotating construction is ideal for impluse buys at cash wraps. Sign holder on top of structure is great for presenting pricing or specials. 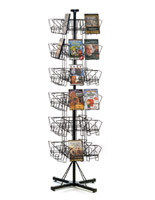 This counter rack, countertop wire CD display that spins will fit into any small space because of its size. 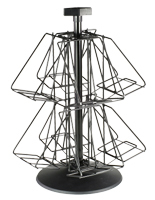 The metal spinner will also make a statement with its capability to hold many CDs. 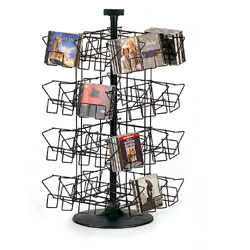 This wire CD display features 32 pockets and can accommodate no more than 5 CDs per slot totaling 160 CDs. Each column and row is part of one spinning piece. The wire CD display will move smoothly because of its construction. 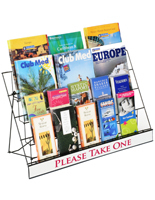 A sign holder is provided at the top of the unit and will hold 1/8" thick signs. 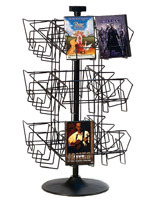 The wire CD display, called a music spinner, is made of sturdy and long-lasting welded metal that has a black finish. Place this near your cash register for a useful addition to you POP station. 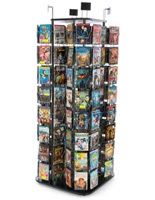 The wire CD display measures 30" and has a diameter of 22" when spinning. Its construction is of lightweight material making it very portable for easy movement.